NEKJE V DALJNI DEŽELI JE BILO SKRITO MAJHNO JEZERO. TAM SO SVOJ PROSTOR NAŠLI RAČKE IN RACMANI, KI SO SE V NJEM RADI IGRALI IN ČOFOTALI. PRAV NIČ JIH NI MOGLO ZMOTITI PRI NJIHOVI IGRI. LE ZIME SO SE RAČKE IN RACMANI ZELO BALI, SAJ JE HUD MRAZ ZALEDENIL JEZERO. TAKO JE BILO NJIHOVE IGRE IN VESELJA KONEC. ŽE SAM POGLED NA LEDENO PLOSKEV JIM JE POGNAL STRAH V KOSTI. VSEENO SO POSKUSILI HODITI PO ZALEDENELEM JEZERU. PRI TEM NISO BILI POSEBEJ SPRETNI, SAJ SI JE KDO IZMED NJIH VEDNO ZVIL KAKŠNO NOGO. POŠKODOVANE RAČKE ALI RACMANE PA SO LOVCI NATO ODNESLI K VETERINARJU. 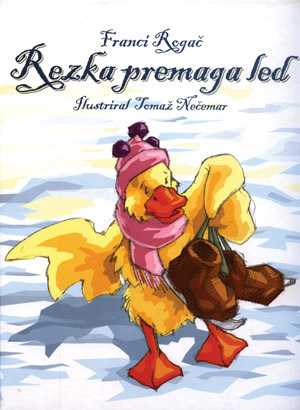 ČE BOSTE TUDI VI KDAJ IMELI TEŽAVE S PREMAGOVANJEM LEDU ALI KATEREGAKOLI PROBLEMA, NE SMETE ŽE NA ZAČETKU OBUPATI. POTREBNO JE LE NEKAJ VZTRAJNOSTI IN ZAGOTOVO VAM BO USPELO. ONCE UPON A TIME IN A FAR LAND THERE WAS A SMALL LAKE. A FLOCK OF DUCKS, DRAKES AND DUCKLINGS LIVED THERE AND LIKED TO PADDLE AND PLAY IN THE WATER. NOTHING COULD DISTURB THEIR PLAYING. DUCKS AND DRAKES WERE ONLY AFRAID OF WINTER. A VERY SEVERE FROST STOPPED THEIR PLAYING AS THE LAKE WAS FROZEN ALL OVER.JUST A GLANCE OF THE ICY SURFACE MADE THEM SHIVER. BUT IN SPITE OF THAT THEY TRIED TO WALK ON THE FROZEN LAKE. CLUMSY AS THEY WERE, THEY OFTEN HAD PROBLEMS WITH TWISTED ANKLES. INJURED DUCKS AND DRAKES WERE TAKEN TO A VET BY THE HUNTERS. THE VET EXAMINED THEM CAREFULLY IN HIS CONSULTING ROOM. HE PUT SOME PLASTER ON THEIR LEGS IF NEEDED. THEY HAD TO HAVE A REST FOR SOME TIME, BUT THEY DID NOT LIKE IT. IF THEY WERE LUCKY THE HUNTERS CUT SOME HOLES IN THE ICE, SO THEY COULD PADDLE AND HAVE FUN IN THE WATER EVEN IN WINTER. IF YOU HAVE ANY DIFFICULTIES IN DEFEATING ICE OR ANY OTHER TROUBLES IN YOUR LIVES YOU SHOULD NOT GIVE UP AT THE BEGINNING. YOU HAVE TO PERSIST AND YOU WILL SURELY BE SUCCESSFUL. IL ETAIT UNE FOIS, DANS UN PAYS LOINTAIN, UN PETIT LAC SECRET. IL AVAIT ETE DECOUVERT PAR DES CANETONS QUI EN PROFITAIENT POUR JOUER ET BARBOTER. RIEN NE POUVAIT LES PERTURBER DANS LEUR JEU. CEPENDANT LES PETITES CANES ET LES PETITS CANARDS EURENT PEUR DU FROID D'HIVER INTENSE QUI GELA LE LAC. CELA MIT FIN AUX JEUX ET A LA JOIE. LA SEULE VUE DE LA SURFACE GELEE LES GLAÇAIT JUSQU'AUX OS. MALGRE CELA, ILS ESSAYERENT DE MARCHER SUR LE LAC GELE. COMME ILS ETAIENT UN PEU MALADROITS, ILS SE FOULERENT SOUVENT LES CHEVILLES. HEUREUSEMENT, DES CHASSEURS TRANSPORTERENT LES CANETONS BLESSES CHEZ LE VETERINAIRE. SI UN JOUR VOUS AVEZ DES DIFFICULTES A VAINCRE LA GLACE OU A SURMONTER N'IMPORTE QUEL PROBLEME, NE DESESPEREZ PAS DES LE DEBUT. UN PEU DE PERSEVERANCE ET VOUS REUSSIREZ CERTAINEMENT.